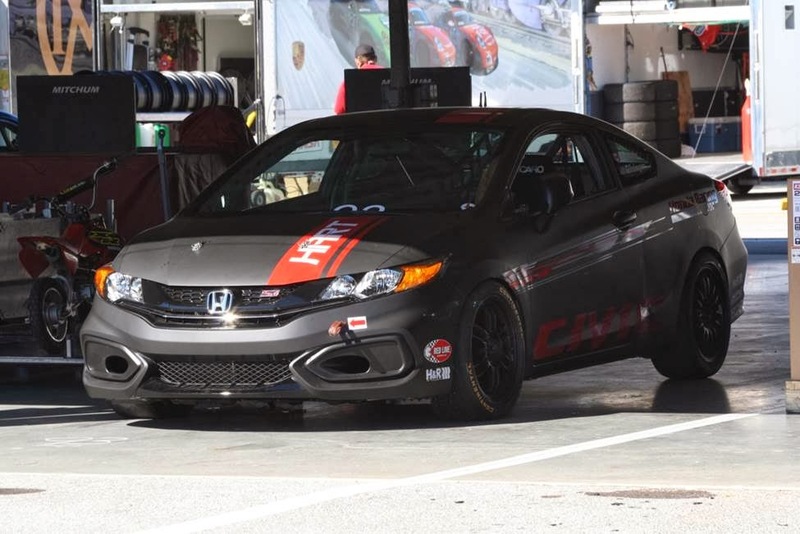 After a long winter break, HART is ready to start the 2014 season with a new 2014 Honda Civic Si and its current 2012 Civic Si from last season. The driver lineup will stay mostly the same with Chad Gilsinger and Michael Valiante driving the #93 and Steve Eich, Kevin Boehm, and John Schmitt sharing duties for the #92 car. The crew has been spending the off-season updating equipment, tools, and most importantly, practicing pit stops. Races are often won or lost in the pits, and HART is sure to be one of the teams to watch down pit lane. 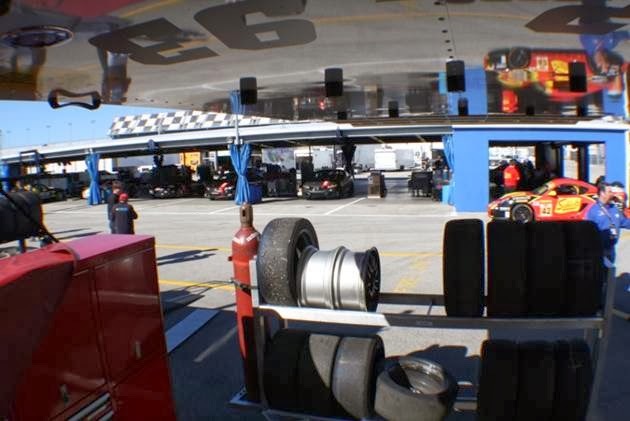 With temperatures being below zero and snow covering the ground, the Ohio-based team had a rough few days loading for this season’s opener, but everyone is always excited to head down south to Daytona. The team has always been strong on the famous Daytona circuit and was leading the race last year until suffering brake pad failure, which forced it to retire. After testing with multiple brake pad manufacturers, the team is confident that reliability will not be an issue this year. Practice 1 would set the tone as each team went on track to kick off the 2014 season. The off-season work and continuous improvement from the team paid dividends early as it led the first practice session, setting the bar for the weekend. Knowing the car was strong, the team used the second practice session to fine-tune the chassis that would keep the car consistent throughout the entire 2.5 hour race. New for this year, teams are required to start the race on the same tires they qualify on, so it will be more important to manage tire wear, even in qualifying. Qualifying is once again a 15-minute shootout for each class. At a track like Daytona, it is critical to get a draft. Without a draft, you can lose 1-1.5 seconds of lap time, which could cost you 10-15 spots on the grid. The team decided to partner with other teams to try and work with one another out on track. John Schmitt qualified the #92 car while Chad Gilsinger qualified the #93 car. Both cars were slotted solidly in the middle of the field in the early laps, but the team knew both cars were stronger. It’s all about timing, and Gilsinger was able to time the draft in the last few laps of qualifying, laying down a 2 minute, 04.861 second lap on the last lap which put him second on the grid, only 0.092 seconds off of pole. Schmitt was unable to catch a good draft and had to settle for 18th in the 35-car field. On the morning of race day, the team used its final practice to focus on pit stops. The drivers would do ‘out’ and ‘in’ laps to practice actual ‘hot’ stops in the pits, just as they would in the race. This was valuable testing as the team was able to set up the equipment perfectly for the race. As practice came to a close, the team only had a couple of hours to get the cars ready for the race. The weather was the best it had been all week, with sunny skies and brisk 60-degree temperatures. The green flag would drop at 1:45 p.m. to begin the 2014 season. Both cars had a great start, as #93 battled with two BMWs for the lead and #92 was able to use the draft to move through the field. The #93 would continue to swap places between 3rd and 4th with another Civic Si, but the two BMWs up front were gaining a little bit each lap. The 6th-gear ratio in the Honda is great for fuel economy in public use, but at 150 mph, it could not keep up with the Autobahn-designed gearing of the BMW. Meanwhile, the #92 car was able to pick up some spots and made sure to stay with the pack until the first round of pit stops. A yellow-flag came out just before the halfway mark, so HART decided to take the opportunity to pit both cars for driver changes. Michael Valiante would take over the #93 car and Kevin Boehm would now pilot the #92. This year, the new IMSA timing and scoring system logs total time from or ’Pit In’ to ’Pit Out’ for each car. The HART crew lived up to its reputation and proved that practice does make perfect as both cars were serviced in almost exactly the same amount of time and their pit stops were among the top five best times among all the teams! At this point, it was up to the drivers. After the first round of pit stops, Valiante was still in the top five on track and Boehm was right around mid-pack. Both drivers were anxious to move to the front, but the second half of the race was littered with cautions that restricted passing and ticked time off the clock. 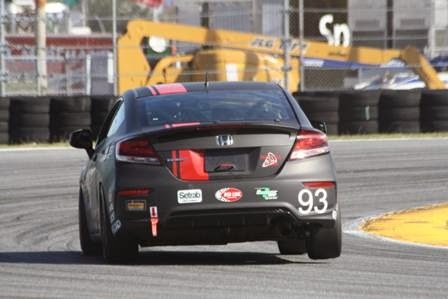 Valiante was able to move up to fourth while battling with another Civic Si fielded by the Compass 360 team, and Boehm was attempting to move into the top 10. 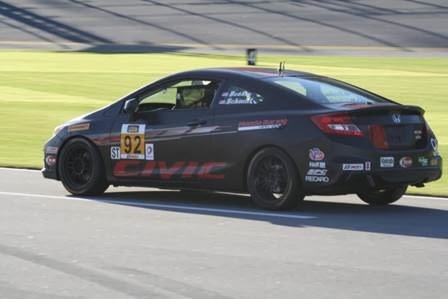 With about 15 minutes left in the race, Valiante and the Compass Civic Si were nose-to-tail while approaching a lapped car going into the “bus stop” turn at 140 mph. The lapped car did not yield to the leaders and caught the Compass car off-guard, causing him to take an evasive maneuver which led to contact with the HART car, and the rest is history. Once again, the bad luck streak at Daytona showed its head, as the Civics made contact with each other and then the wall. The race was done for the #93 car, and would now end under caution to clean up all the debris. This would ultimately hurt the #92 car as well, forcing it to finish in the 13th position under caution. “It’s not really the result we were hoping for, but at least we know we have strong cars”, said crew chief Andrew Salzano. “The crew did an awesome job during the pit stops and the drivers showed our competitiveness. We did everything right, but we were just in the wrong place at the wrong time.” The damage to #93 was limited to mostly bolt-on parts, so the team should be able to repair the cars quickly for the next race in mid-March at Sebring. 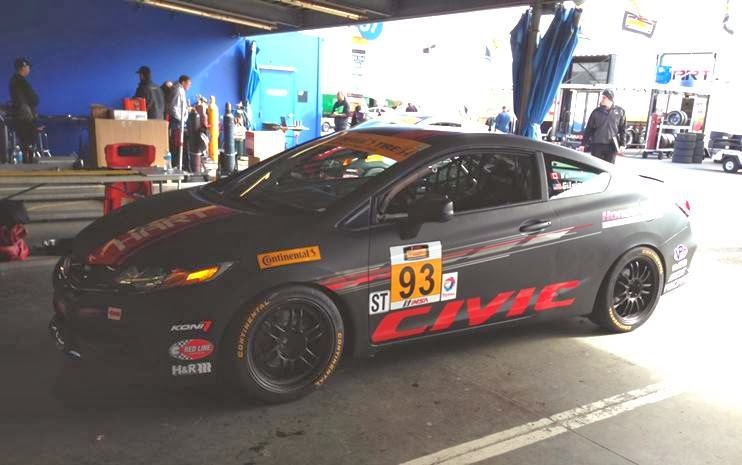 This will be the first time the team has been to Sebring in many years and the first time it will run the Civic Si there. This first race was filled with plenty of ups and downs, but the HART team has high hopes moving forward. This being Race One of a 12-race series, the excitement has just begun. The next event will be at Sebring on March 12-15th. This will mark the first time for many HART members to visit this historic track.